Happy Summer, I mean Autumn! It has been a busy summer, now I missed a summer blog post so here is our fall farm update. In this part of California it still feels like summer almost;). Farmer Rowan’s has headed back to preschool and the mornings are crisp and the nights are getting colder. Farm Update - It is a great time to visit the farm! We have moved the weekend tours to 11 am to avoid the heat of the day. The weather has been really nice out here, excluding a few hot days. It can be a bit hot if your carrying a bundle of electric fence up a steep hill, but besides that, very pleasant. There are lots of baby animals right now as we have two litters of piglets. We recently harvested a bumper crop of squash that is available in the farm shop. Pumpkins on Pikes was a great success, hope you all were able to make it. We are beginning the slow clean up. It’s almost the the time to plant trees, and we hope to get as many as we can in the ground this winter. We have also been planting an herb garden for animal health, it will be a treasure trove for keeping all our animals healthy. New on the farm we have a friendly chicken named Pecker that lives with the goats and runs around the parking lot. The animals are all doing great. Turkeys - The turkeys are out standing in their field. Turkeys are one of my personal favorite as they are very inquisitive and friendly, if you have a chance to visit us, I recommend taking the time to visit them as well. Cows - The big exciting news is we have borrowed a bull from a neighbor and are expecting calves in February of next year. We have one Calf right now who was a pleasant surprise (we had purchased a pregnant heifer without knowing). Although close to the birth it was obvious that the mom was expecting, and not just growing really big. Pigs - The pigs are loving this cool weather, We are still recovering from the summer when the electric fences did not work as well. We have a few sections of the property that have a perimeter fence, back up for our electric fences when the ground is dry and little piglets are not heavy enough to have the fences work. The breeding pigs are still in the corrals by the drive through barn. Come check them out. Chickens- Our new batch of 500 chicks have grown into teenage poulets. They are close to the parking area in the corner brooder. During the day they are out grazing with the sheep. Follow us on Facebook and Instagram for more animal cuteness and farm happenings. We love events on the farm! As the sun goes down the whole farm is filled with golden light, kids love to run and visit the animals. A magical place and time to share with friends while the event barn lights twinkle and the stars come out, with a glass of wine in hand, the air is filled with music. No place I would rather be! Ask about our event space rental. Join us and our Lovely sustainable flower grower Mandy, for a crafty day on the farm of wreath making. No experience needed. November 18th 11am-1:30pm $65 All materials included (a wide selection of design materials), light snack and beverage. This is a gem of a class and last year it sold out so get your tickets soon:). BONUS pick up your Turkey after the class and be Thanksgiving ready! Please join us on the farm for a hot drink and to pick up your Thanksgiving turkey. Take a self guided tour of the farm, regular guided tours at 11:00am Saturday and Sunday. Our Pasture raised turkeys are now available. You can reserve yours online. These birds have been organically fed and rotated on our organic pasture. Nothing extends those summer time vibes quite like the smoky-sweet flavor of BBQ. We love eating outside on the grill and these fall days are perfect for cooking up some mouth watering eats. This recipe is a great way to up your BBQ game, perfect for a special get together with friends and family. Our Membership coordinator Brandon has been drooling over this method of grilling all summer and has put together this recipe for us. It is a great recipe for when you have a little extra weekend time to be at home to keep an eye on things. 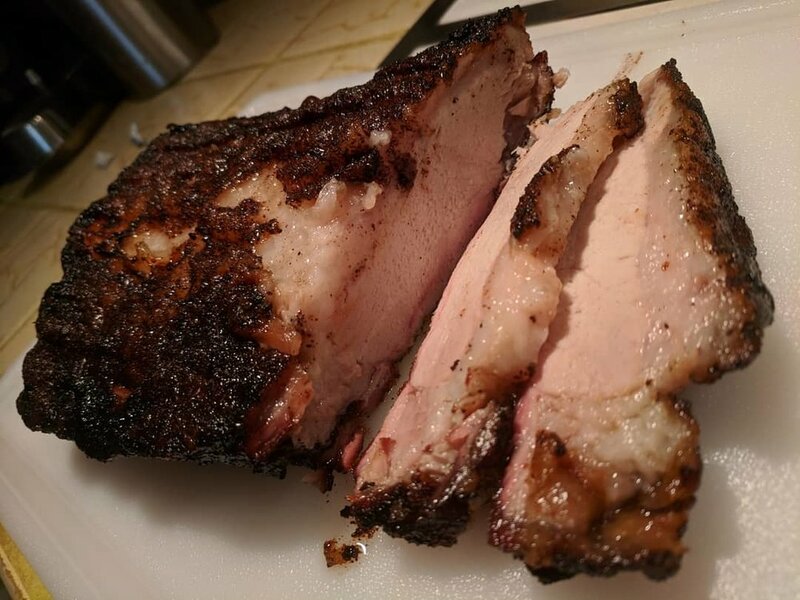 1 CUP SONOMA COUNTY SPICE QUEEN BBQ DRY-RUB (Now Available in our CSA) or similar BBQ rub. 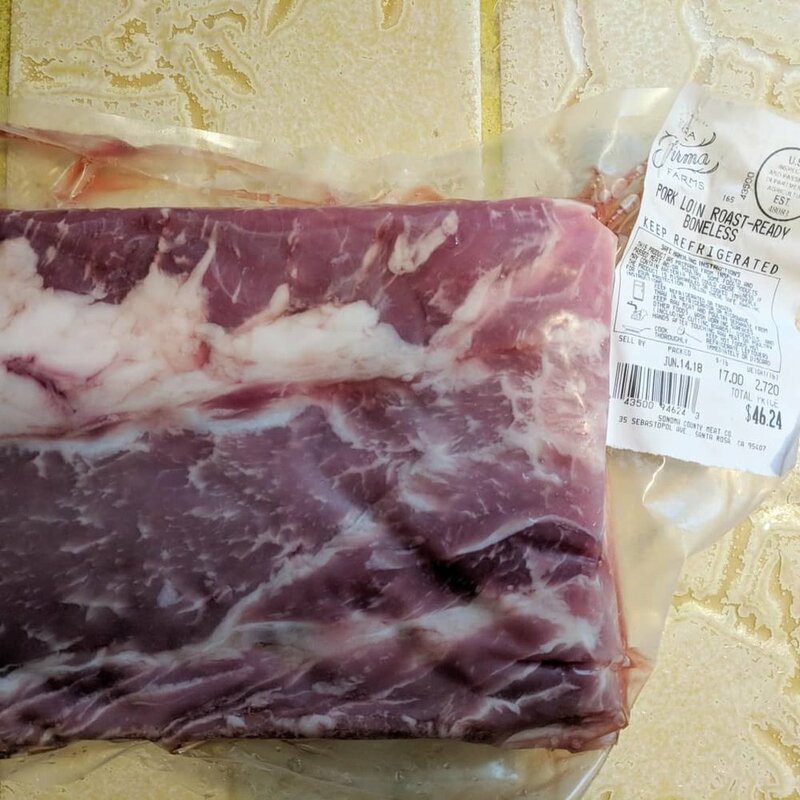 Place the pork loin in a glass bowl. Add salt, whole peppercorns, and add filtered water until loin is covered. Let soak in brine overnight or 12 hours in the refrigerator. Start your wood chips soaking the night before as well. PREPPING THE GRILL: Remember. INDIRECT HEAT is the key to cooking this cut to perfection. Charcoal: Start the coals using a chimney so you are not having to use lighter fluid. Once they are ready, pour the coals on one side of the BBQ. Place your grilling surface over the coal until it is nice and hot, then move it to the opposite side of the BBQ away form the coals. Have a place you can prep more coals as needed as you will need to keep adding them as you go. Propane: MAKE SURE YOUR PROPANE TANK IS FULL. THIS IS A LONG COOK TIME. Start the night before by soaking mesquite or apple wood chips in water overnight. Drain the water off and place on the smoking rack in the preheated grill (you can use a tin can to lift it up if you do not have a smoking rack). Place your roast fat side down on your grill on the opposite side from the heat. CLOSE THE LID. Check it every 30-40 mins to be sure your coals are OK. THEN LET THAT PUPPY COOK FOR 4.5-5 HOURS! ENJOY THAT AMAZING PORKY GOODNESS. Best accompanied by potato salad, grilled apples and some ‘slaw.